It’s not always easy to find high-quality Bluetooth speakers that offer solid sound quality and look good for an affordable price. The Inateck Marsbox comes darn close to being your go-to Bluetooth speaker, especially on the go. When looking for a Bluetooth speaker, you’re looking for something that sounds good, looks good and will last. Does the Marsbox live up to those standards? Let’s find out. We’ll take a look at my thoughts on the Inateck Marsbox and whether you should invest in this booming speaker. Note: Please ignore the dented box, this was due to the way Amazon packed the product and not Inateck. The Marsbox is made by Inateck and comes in an attractive packaging that right away make you feel like this is high-quality. It boasts a dual 5-watt driver, offering bass and loud sound something missing from many similar speakers on the market. 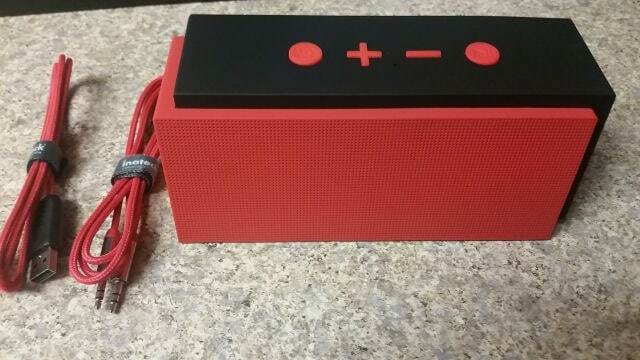 It has a unique design as you can see from where the speaker sits and its bold red makes this stand out from the muted colors you see from Bluetooth speakers elsewhere. The reason I’m mentioning the packaging is that I was blown away by it when I first received the speaker. 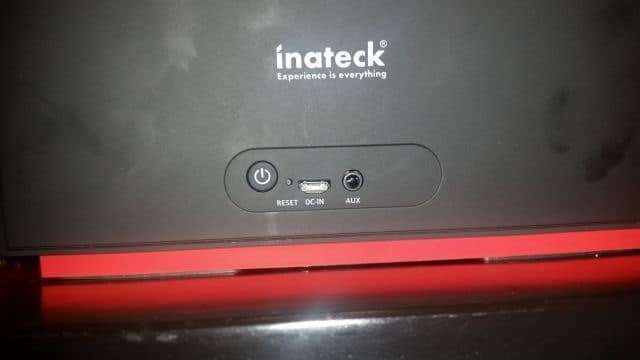 The packaging shows Inateck care about its product and how it arrives in your hands. 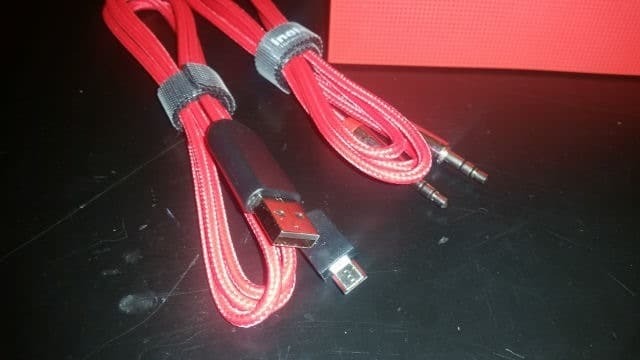 One of the unique features of the USB charging cable and 3.5mm audio cable is that they’re a threaded design instead of your typical silicone/plastic feel, offering a sleek look to even the cables you’ll be using with the speaker. While Inateck, and the manual that came with it, says the speaker will work for up to ten hours, I found that on a single charge I could get 12 to 13 hours before recharging. This was impressive, especially out of the box. The sound quality is beautiful for a speaker of its size and price range. You’ll be impressed by the bass in particular which doesn’t break up like other speakers in this range. I was impressed by how easy the speaker was to pair, as well as control either via apps or its built-in controls. This speaker can get loud, so it’s important to control the volume song-to-song in case it’s too loud for the surrounding area. It’ll take some time to get used to how loud it gets and how loud is comfortable for you, so try out some calls, songs and other playback to get it just right for the media you’re listening to. The Marsbox can also be used as a speakerphone, allowing you to speak and hear conversations through the speaker as opposed to a headset or using your phone. This comes in handy if you’re listening to music and need to take a call when you’ve stepped away from your phone. The only real issue I had with the Marsbox was the texture of the non-speaker portions. Fingerprints easily smudged the texture and were hard to get out. Other than, the sound quality, ease of use and controls of the speaker worked well for me and I imagine anyone giving it a shot. Another downfall of this speaker is its size if you’re looking for something more portable but this shouldn’t be a deciding factor if you’re looking for quality versus affordability. Affordability should win out when choosing the Marsbox. Overall, I was quite impressed by the Inateck Marsbox Bluetooth speaker. It was easy to use, sounds amazing, and allows me the functionality to take calls, too. What’s not to love in a speaker that looks this pretty? 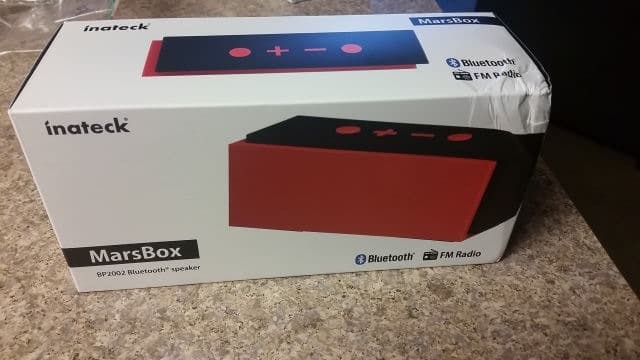 If you’re looking for an affordable, high-quality Bluetooth speaker, the Marsbox is it. Buy the Inateck Marsbox here at Amazon.com. Disclaimer: The above company sent us the product for testing. However, that has not swayed my opinion of their product one way or another. All conclusions are based on at least a week of careful testing. Next articleInternet Explorer Still Lurks in Windows 10, but Should You Use it?